We have come to expect our homes to look a certain way, following set architectural rules and adhering to accepted building principles for domestic habitation. From quaint Tudor cottages to imposing Edwardian homes, period homes in Britain are expected to look, well, predictable. But what if they don’t? Britain certainly has its share of quirky houses that will make any passer-by stop, stare and scratch their heads. Since consulting with a number of architectural conservation specialists (such as Hutton and Rostron) we’ve put together an entertaining selection of 5 weird and wonderful residential properties whose appearance seem to have neither rhyme nor reason, having been created as a process of history. 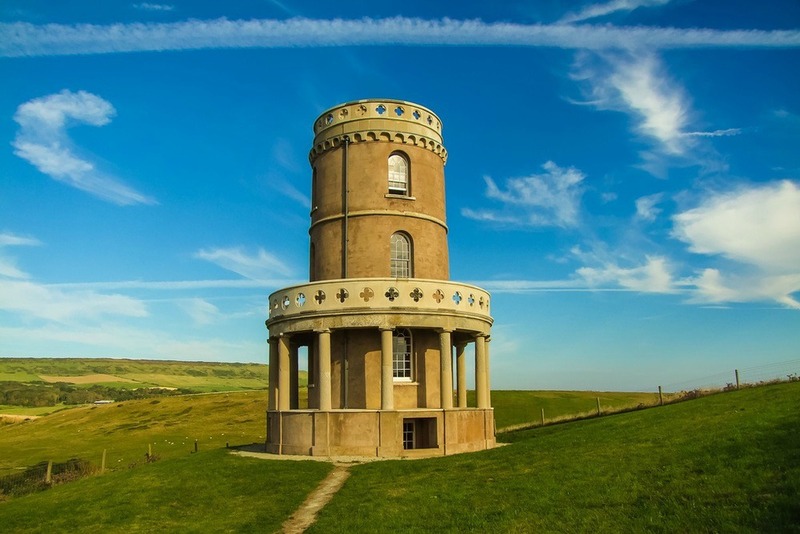 Built in 1830 and set in a spectacular location atop Hen Cliff overlooking Kimmeridge Bay on the Jurassic Coast, Clavell Tower was originally designed as an observatory and a ‘folly’ – a bit of an indulgence for Rev John Smedmore who owned the estate. The Grade II listed Tuscan style tower has 4 floors including a basement and makes a lovely home. In 2006, a major project began to move the building away from the cliff edge by 25 meters, and Clavell Tower was put into the care of English Heritage and the Landmark Trust, who now run it as a holiday property. Well known as one of London’s weirdest houses, No. 5 Thurloe Square in affluent South Kensington is a bit of a tourist attraction. The ‘Thin House’, as it’s known colloquially, is wedge shaped – being only 7 foot wide at the western end and widening out to 34 foot at its widest point. Situated in a quiet square between South Kensington Station and the V&A Museum, a studio apartment in the building was recently for sale at just under £900,000. The reason for the unusual shape is the railway line that runs right behind the building. It’s unclear whether the house was originally designed and built with a triangular footprint, or whether its shape was altered when the track was built. This unusual building, or at least its spectacular addition, was the brainchild of the 4th Earl of Dunmore who returned home in 1776, having been the Governor of Virginia. Pineapples and other exotic fruit were highly prized trophies in those days. Associated with hospitality and wealth, pineapples quickly became popular as architectural decoration. Upon his return, the Earl chose to place a giant pineapple structure (37 foot high!) as the main feature for his summer house. Essentially classical and unorthodox at ground level, the eccentric addition is made of the finest masonry, with shoots and prickly leaves that are a feast for the eyes. There’s a private garden with steps leading into an elegant room within the Pineapple itself. Gifted to The National Trust for Scotland in 1974, The Grade A listed Pineapple is one of Scotland’s most remarkable buildings. This quirky Grade II listed pavilion and later toll house dates from around 1807; some say its origins go back as far as 1575. Noted for its special architectural and historic interest, this tiny house is in the shape of a bottle, hence its name. Set in the pretty village of Tixall, the Bottle House or Bottle Lodge is situated next to an ancient bridleway and opposite Tixall Farm. Constructed from ashlar stone with an ogee stone vaulted roof, the building has an octagonal shape, mullioned windows, molded stone eves and a cambered stone doorway. Originally built in 1923 as a water tower for the village of Thorpeness, the unsightly structure was later ‘disguised’ as a house. From a distance, the ‘House in the Clouds’ looks like a cottage lodged 70 foot high above the trees. It has a magical quality about it and is now one of the best know quirky houses in Britain. Having been damaged during World War II, the main water tank was removed and the additional space finally converted to a house in the 1970’s. The cottage itself now features 5 bedrooms and 3 bathrooms. No longer operating as a water tower, it is now a favored Suffolk heritage site and available as a holiday let. If you didn’t know there were really weird period homes in Britain, well now you’re a bit wiser. Next time you travel to Britain, be sure to check a few of these out! Looking for travel tips for your upcoming trip? Check out my travel advice and killer deals!